This week was a whirlwind of activities. 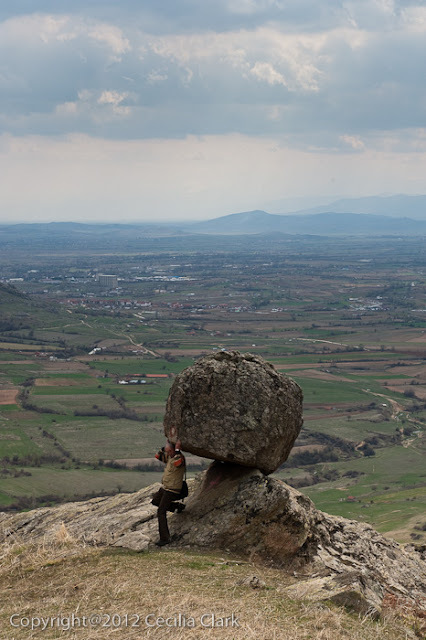 Azita and I visited museums, shopped, went to a performance by the Macedonian Philharmonic, and we arranged a visit to the city of Prilep to hike and see monasteries. On Friday, March 30, we met Angel (our Skopje guide) at his travel agency at 6:00 a.m. It was Azita's birthday, and Angel surprised her with a small, luscious cake complete with a lighted candle and a bottle of wine. 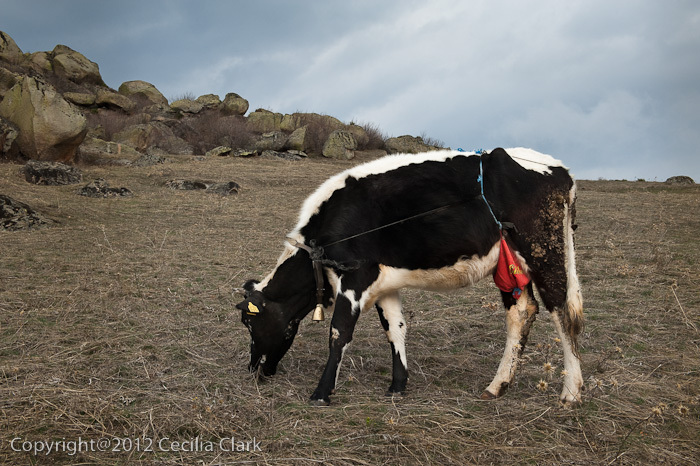 Two hours later we were in Prilep, met Milan (our Prilep guide), and ate birthday cake for breakfast. 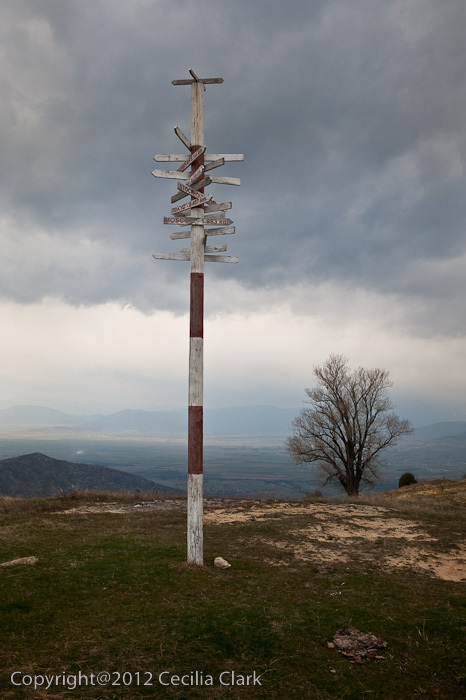 Prilep, sitting on the Pelagonian plain, is a tobacco town of about 70,000 residents. Almost every house we passed had structures for drying tobacco leaves awaiting the next harvest. 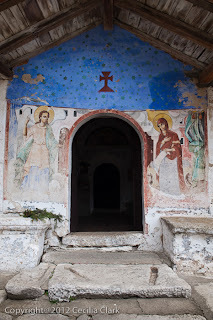 Our first monastery visit was to St. Archangel Michael in Varosh. It is located part way up a hill that is topped with the ruins of the 14th century Fortress of Serbian-Montenegran King Marko (Markovi Kuli). The monastery is presently occupied by nuns who were up and gardening when we arrived at 8:30 a.m. The church is spotlessly clean as are the grounds. Two small white cats have made this nunnery their home. 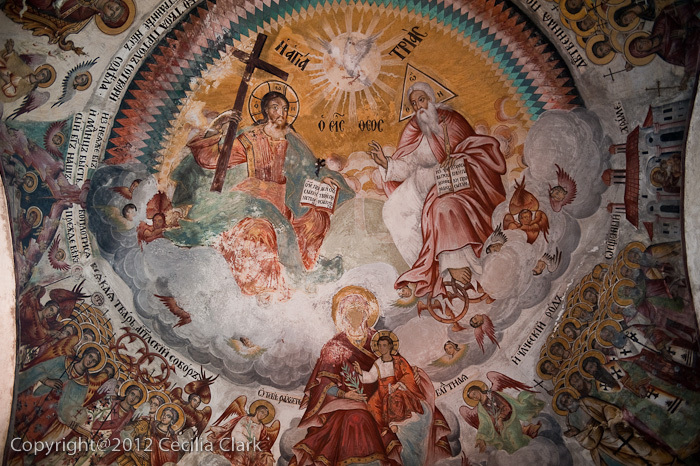 The dome of the church was rebuilt after a large boulder rolled down the mountain and destroyed the original structure. The bottom portion of the church dates to the middle ages. The white building is the nuns' quarters. The structure was built in the 19th century with a"city-style" architectural design. The structure is incorporated into the rock face behind it. The "judgment" fresco is above the entrance gate leading to the enclosed monastery. The scene depicts Archangel Michael as judge. In his left hand he holds scales and the soul of the deceased. On one side of the scale is the person's heart; the other side holds a pile of rocks. 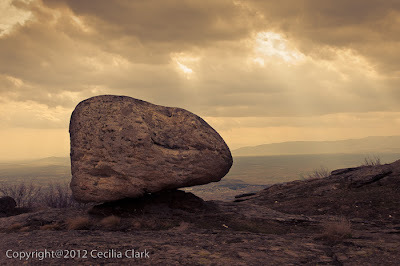 To enter heaven, the altruism and good deeds of the deceased must outweigh the pile of rocks. 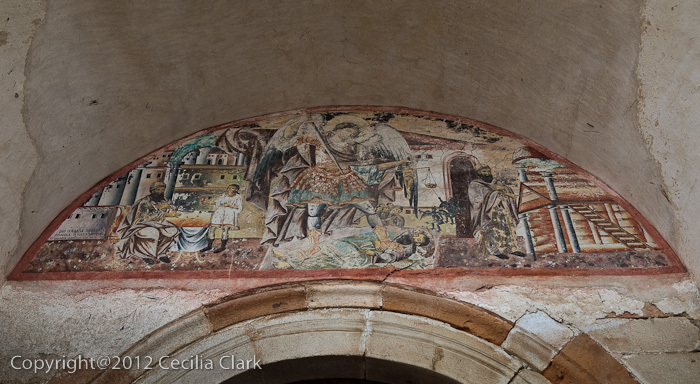 This fresco includes two small devil-like creatures that are using a stick to weigh down the the side with the rocks, so that they may be given the soul of the deceased. 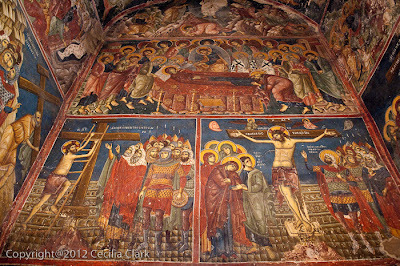 The frescos inside of the church depict scenes from the life of Jesus as well images of sainted people. Many of the people have had their eyes removed. Milan offered several explanations for the missing eyes. 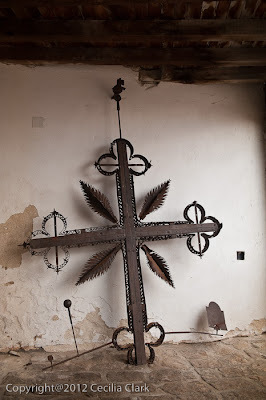 First, the eyes were removed by the local people so that the figures would not see the destruction of the church at the hands of the Turks. 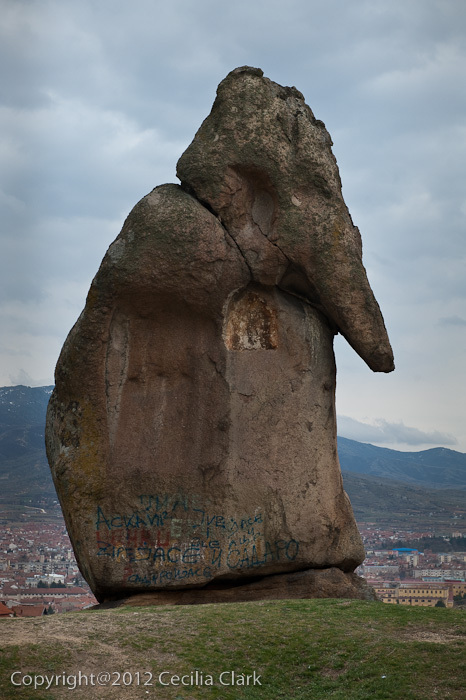 Second, the Turks removed the eyes because as muslims they could not condone figural representations. Or three and possibly the most reasonable explanation, the local people believed that they eyes could heal illness so they gouged out the eyes on the frescos and used the resultant plaster to cure sickness. The second stop in the Varosh settlement was to the small church of St. Nikolas. Nikolas was the model for Santa Claus and is the patron saint of sailors, merchants, and prostitutes (according to Angel). The church of St. Nicolas was built in 1298. 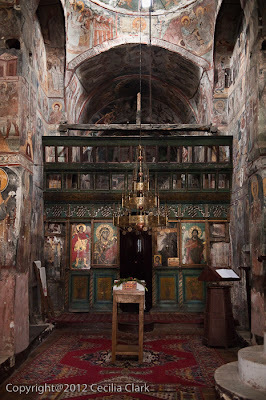 The church has lovely frescos but it is not well maintained with 20th century windows/doors, shabby carpeting, and a deteriorating roof. The scene in the second photograph of the above frescos depicts the death of Mary (Dormition of Mary). 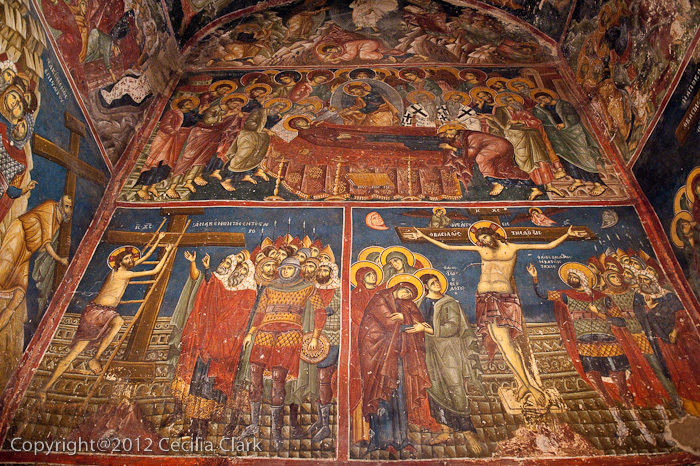 In Macedonian religious architecture, this scene is always on the west wall of the church while the altar faces Jerusalem in the east. 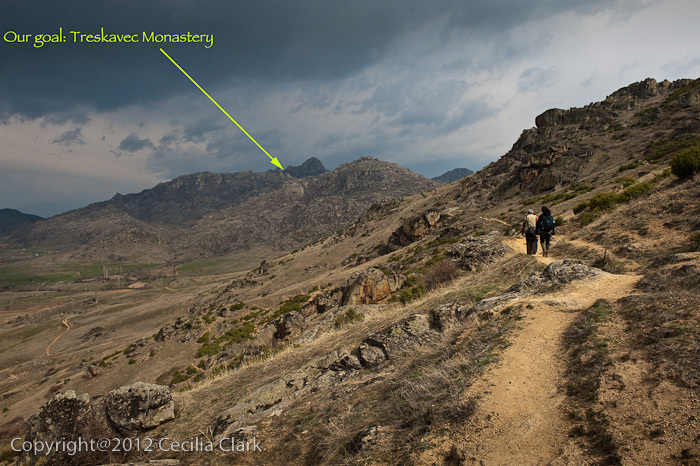 Our third monastery was seven kilometers (4.3 miles) away and 700 meters (almost 2300 feet) higher by foot. 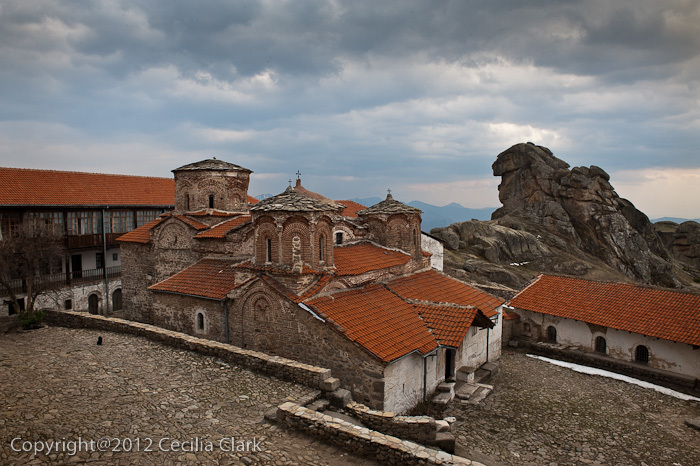 Treskavec Monastery located behind a rocky outcropping and at an elevation of about 1300 meters or 4,300 feet is not visible from the trail that leads to it. 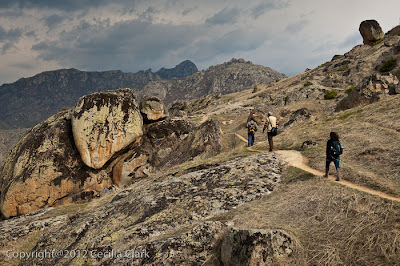 The barren landscape consists of sharp, craggy rocks scattered precariously above and next to the trail. Hazelnut and Alder bushes survive in the more protected, wetter areas. There are a couple of steep climbs including one that is over bare rock. There is a rope, actually a flexible electrical cord threaded through some candy-cane striped posts, that provides a small sense of security as we climb up the smooth rock face to the next level knowing that there is a storm brewing in the dark clouds above us, and that we are the tallest thing on this part of the mountain. At the top but before we arrive at the monastery there is a sign post pointing out the distance to cities around the world. The arrow for Los Angles says it is more than 10,500 kilometers (more than 6,500 miles) away. 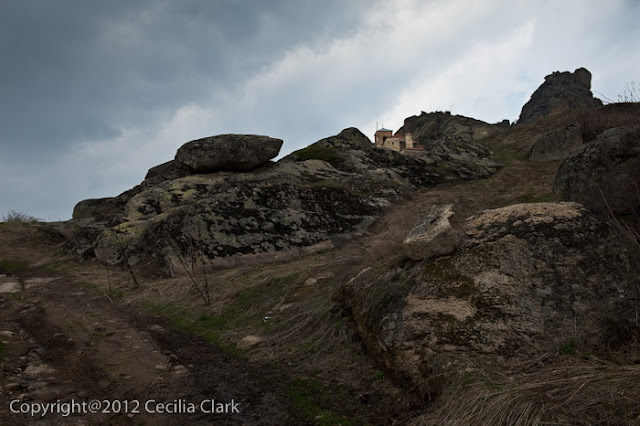 Almost at the top of the ridge and around the corner we are able, finally, to glimpse the Treskavec Monastery. 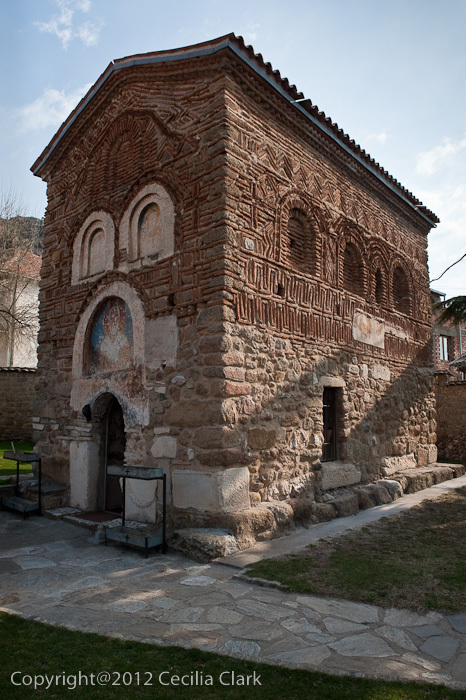 The 14th century church of Sveta Bogorodica (St. Mary) sits inside the monastery's protective wall. Our one-way hike time was 2-1/2 hours. 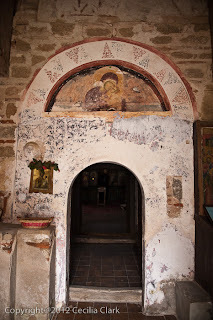 The outer and inner entrances to the Church of Sveta Bogorodica are not very tall. 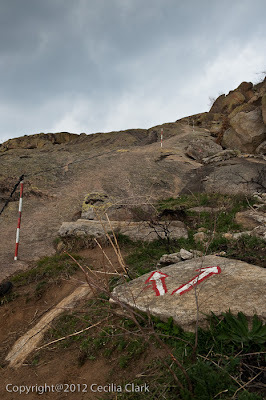 Milan told us that there are three possibilities for the short height of the entrances. First, ducking or bowing your head to enter shows humility. Second, people in earlier centuries were shorter. Third, the entrances were made this size so that Turks could not ride their horses into the church. This monastery complex is occupied by one monk. While he does have one or two non-monk helpers, it is clear that he could use an army of assistants for the upkeep. The kitchen was filthy with dirty dishes and tables. There are several dogs and puppies that live within the complex, and no one cleans up after them. Perhaps I'm being too harsh. It has been an unusually cold winter and there were still patches of snow in the shadier parts of the monastery grounds. 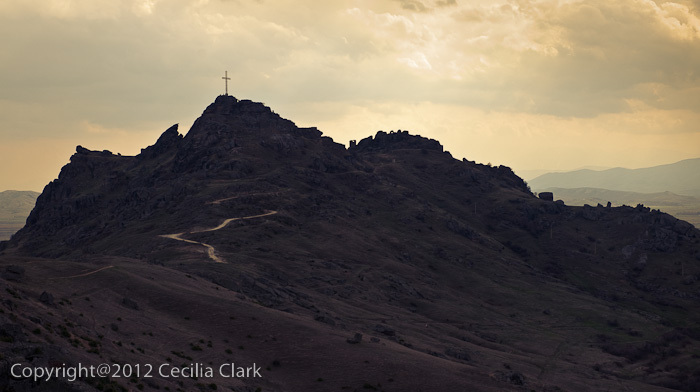 Hikers can hike in and stay overnight in the many rooms that surround the church. Inside of the church, the walls seemed to be crumbling before our eyes. 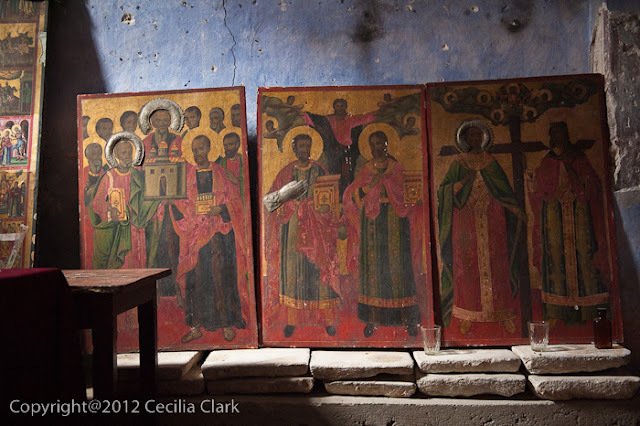 Restoration and stabilization of this jewel of a church are needed now if it is to be saved. 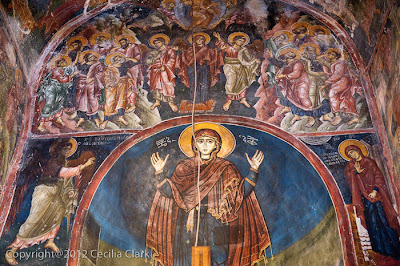 This church is built over a 6th-century basilica that was built over a pre-christian temple. 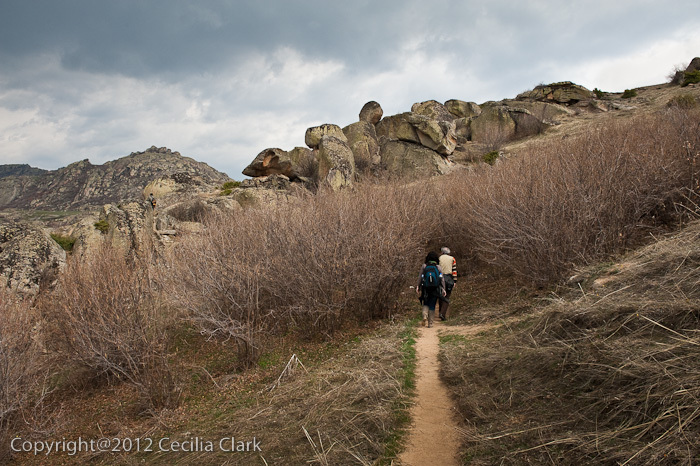 After lunch and a visit to the church, we headed back down the mountain. As we walked the weather was getting colder, windier, and darker. 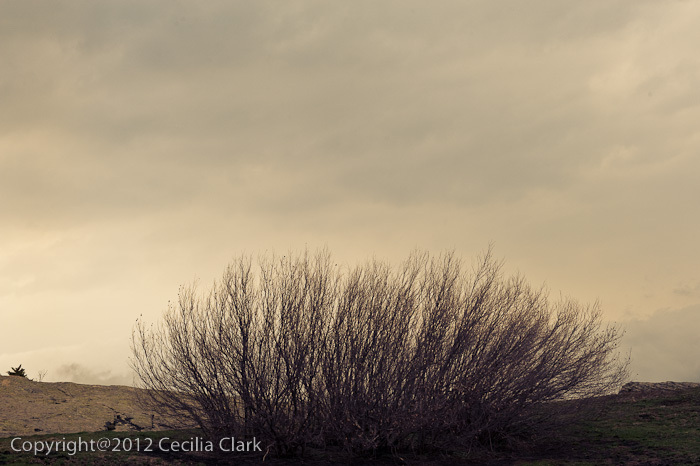 The below photographs are "split toned" and capture the mood of the threatening storm. 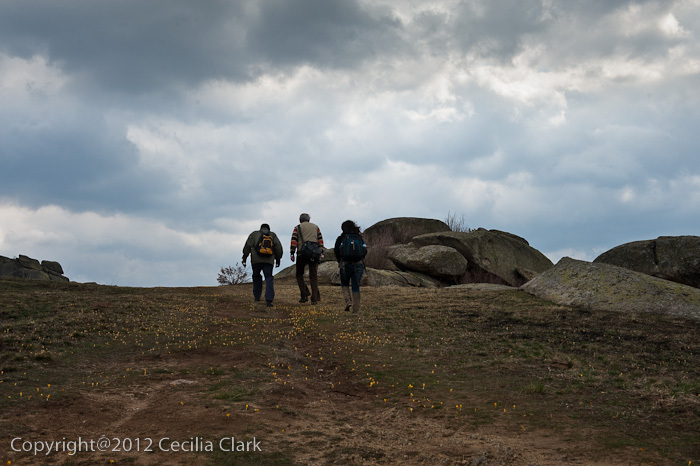 It took two hours to get down the mountain, and it began to sprinkle as we finished the hike. The 6-1/2 hour round trip hike included 1-1/2 hours at the monastery for lunch, resting, and sightseeing. 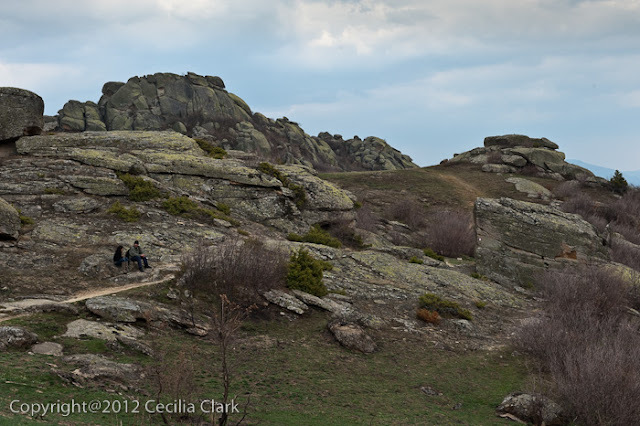 Leaving Prilep and Milan (our guide), Angel, Azita, and I headed to Popova Kula Winery for dinner and a little wine tasting. The perfect conclusion to a long adventure in Prilep and Azita's last day and birthday in Macedonia.